Frankfurt residents officially speak German as their formal language, but they also use a dialect unique to the area – Frankfurterisch, which uses expressions and terms that those in other German cities will struggle to understand. Conventional German will be fine, however, as will English is many areas – as Frankfurt is such a business hub most people will be multi-lingual, and the closer you are to the city center, the more likely you are to get by without understanding much more German than Guten Tag. As you drift towards the outskirts of the city, however, locals will respond considerably better to at least a token attempt to speaking their mother tongue. The weather in Frankfurt is a little more welcoming than some other German cities, with the winters less harsh than you may find in areas such as Berlin and very warm summers – the hottest in the country, in fact. As per many German cities, however, rainfall is frequent – even in the summer. You will not find many locals leaving their homes without an umbrella throughout the year for good reason. On paper, getting the appropriate paperwork together to relocate to Frankfurt is very simple. Any US national will not require a Visa to enter Germany for three months or less, but if you are hoping to remain in the country to live or work you’ll need to apply for a Aufenthaltserlaubnis (temporary residence permit which could be issued for anything from 1-3 years) or Niederlassungserlaubnis (permanent residence permit, which is only applicable to people that have lived in the country for over five years and have passed a citizenship exam). You must do this within a week of arriving in Germany, but in the case of Frankfurt, it is highly advisable to take care of your permit – and accommodation – before you leave the States. As immigration into Frankfurt is so popular, the local authorities will only approve permits for employees that can prove that they will earn a salary at least €400 per month above their housing costs. Consult one of the German consulates dotted through the US (or the embassy if you are close to Washington) to get the ball rolling on your application. Whilst you will have to travel cross-country to Berlin to visit Germany’s official American Embassy, Frankfurt does host its own US Consulate in Gießenerstrsse. This service will be able to assist with any queries relating to passports and employment permits. If you wish to bring your pet to Frankfurt with you, first make sure that you are permitted to do so – almost anything goes (provided your furry family member has a pet passport, microchip and proof of all vaccinations, including rabies), but certain dog breeds are banned throughout Germany. Do your research to ensure that your will not be violated international law. If you are bringing a dog into Frankfurt, you’ll also have to register it with the local authorities and pay a Hundesteuer, or Dog Tax, within two weeks of arrival. Frankfurt’s port may not be home to many luxury cruise liners, but it can be used for freight shipping – consider this method of bringing your worldly goods to Germany rather than the considerably more expensive form of air travel. You shouldn’t need to worry too much about what to pack – Frankfurt has abundant opportunities for elite shopping, so you can stock up on designer labels upon arrival if you need to. Just make sure that you have suitably waterproof clothing to see you through the early days of your arrival, especially if you are flying in during the summer. Frankfurt is widely regarded as one of the business capitals of Europe with an extremely low unemployment rate, so if your business is within the financial realm, you will find all kinds of opportunities open to you. Big pharma is also a sizable presence in Frankfurt, so if your background is scientific you’ll find work here. This is all assuming you have managed to arrange your residency permit before arriving, though – remember the limits placed upon immigration. One advantage that you will have, however, is that English is the primary spoken language in business dealings throughout the world, including Frankfurt. Fluency in this language will give you a headstart over other applicants for the same role – though it remains advisable to learn German, as this will be the native tongue of many key decision makers. It’s not just banking and commerce that provides employment opportunities in Frankfurt, though; with so many busy people in the city, a number of international employees seek work as nannies and au pairs. Just tread carefully here, as live-in positions involve impermanent addresses and may not be looked upon favorably for a residency permit. You can even gain access to Frankfurt as a freelancer, provided you have a native sponsor and can prove that your business will benefit the city at large. Frankfurter Schule, or The Frankfurt School, is one of the most celebrated educational institutes in the world thanks to its studies into philosophy and sociology. There are more conventional education centers in the city, however. Despite the sizable contingent of workers from all over the world to Frankfurt, there are not actually too many international schools in the city. US citizens would be best served investigating ISF Internationale Schule Frankfurt-Rhein-Main, which provides an American curriculum for children aged between 3-18. Alternatively, if you are happy with your children picking up a standard International Baccalaureate, check out the Strothoff International School, Frankfurt International School or Metropolitan School. The Johann Wolfgang Goethe University is one of the oldest institutions in the city, with over 70% of its student body made up of international pupils – and it also includes the Goethe Business School, making it an ideal destination for any young people that are considering settling in Frankfurt upon completing their education. The Frankfurt University of Applied Sciences, meanwhile, will be the ideal location for anybody considering a career in medicine or pharmaceuticals. Frankfurt is actually one of the most reputable cities in Germany in terms of healthcare, potentially because of the sizable number of high-powered citizens. Hospitals – both public and private – are plentiful and maintained to excellent standards, and are found to be generally more efficient than those found in other cities. Healthcare expenses in Germany are covered by insurance, the cost of which will be split between yourself and your employer (though you will have to make a small payment for doctor’s appointments). As your employer will most likely offer you private health insurance as a perk, however – or at least a salary that makes this something that you can consider – such a policy is recommended. Frankfurt has a number of specialists in a variety of medical fields, and private insurance will help you bypass any waiting lists. Frankfurt is a little more expensive to live in than a city such as Berlin – housing, for example, could be closer to €1,700-1,800 (almost $2,000) per month in a desirable area. Of course, the average salary in Frankfurt is also higher than that in Berlin, so it’s swings and roundabouts – though do take into consideration that you will more than likely be working in a substantially sized and isolated corporate HQ with its own cafeteria. This means that meals will either be at subsidized prices, or used as an opportunity to hold you to ransom due to the lack of alternative options, depending on your luck! The cost of entertainment is largely comparable to other major cities (though theater entertainment is pleasantly surprising in how cost-effective it can be in Frankfurt). 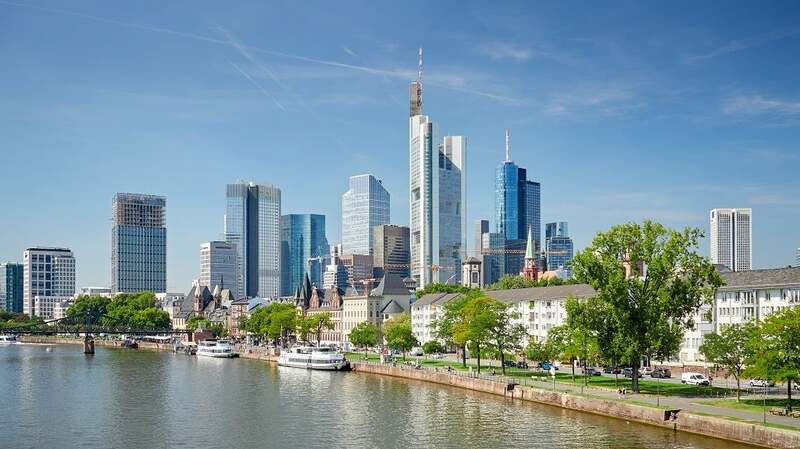 Thanks to the strong Euro and the fact that most jobs in Frankfurt will pay a very respectable wage, purchasing power within this city ranks very favorably on many index comparisons – Frankfurt is considered to be one of the richest cities in Europe. It may not be quite as exciting as Berlin, and a little costlier in terms of housing another essentials, but there is still plenty to do and spend your salary on – of which you should have plenty left over once essentials have been taken care of. If you’re hoping to drive when you arrive in Frankfurt and convert your American driver’s permit, you’ll have to prepare yourself for a great deal of administration – and, potentially, expense. Sadly, this is unavoidable. A German driver’s license is known as a Führerschein, and how easily you obtain it depends on where you have moved from. Some US States have what is referred to as a reciprocal relationship with Germany, and as a result you’ll be able to transfer your license with a minimum of fuss. If you are not part of this lucky handful of locations, alas you’ll have to retake your test in Frankfurt – a process that will involve lessons at a driving school as well as written and practical exams. Tram is the preferred transport of Frankfurt’s city center natives; running every ten minutes (five during peak periods), you will be able to hop from one end of town to another with a minimum of fuss using these facilities. Frankfurt also enjoys two train services, the overground U-Bahn (which is replaced by buses after around 1am) and the rapid subway service the S-Bahn. Be careful of the latter, though. Although it’s fast, pickpocketing and other such crimes ate rife on the subway, and it’s advisable to avoid if you are carrying substantial sums of cash or anything else of value. Cycling is also popular in Frankfurt, and you’ll be able to hire a bike that can be locked up at secure locations throughout the city. As Frankfurt has a number of cycle lanes that do not allow automobiles to enter, this could be a great way of exploring the city at a leisurely pace when you first arrive. As such a thriving business hub it’s hardly surprising that Frankfurt Airport (FRA) is one of the busiest in the world. Conveniently located in the heart of the city, Frankfurt Airport serves long haul and short haul destinations (including Chicago, San Francisco and New York), also acting as the central resource of the German national airline Lufthansa. Frankfurt enjoys the use of a small port, located in the heart of the city. The port itself is used for commercial purposes as it’s too small for luxury cruise liners to depart and arrive from, but it’s a beautiful part of Frankfurt in itself – and may come in useful when you’re looking to ship your possessions into your new home, saving vast sums on air shipping. There are neighborhoods in Frankfurt to suit a variety of desires, whether you are seeking somewhere filled with life and vibrancy thanks to a youthful population or a conventional family area – or indeed, anything in between. Look into Niederrad if you want to be close to the commercial heart of the city – and have the budget to accommodate this more expensive area in Frankfurt. Niederrad is close to the airport (but not so much so that you will be subject to noise pollution), which means that you’ll have excellent public transport links on your doorstep, as well as plenty of entertainment. Grüneburgpark is another option for those who are not concerned by budget; this is the most upmarket area in Frankfurt, and is filled with sleek buildings and public green spaces. Bornheim will provide plenty of accommodation options, with a variety of high-rise apartments, and easy access to the city center, and Sachsenhausen is heaven for culture vultures – you’ll have no shortage of things to do in this part of the city as it’s in the heart of the museum district. For travelers with families, meanwhile, take a look at Kronberg – close to a variety of excellent schools – or Nordend, which is a quiet area with a strong sense of community spirit. It’s not just capitalism that is worshipped in Frankfurt – this city prides itself on its contributions to high culture. The Old Opera House is regarded to one of the finest such venues in Europe, and the theater culture of Frankfurt is widely celebrated. You’ll also find a huge number of museums that will cater to every taste and interest. The biggest event in the annual Frankfurt calendar is the Main Festival, which unfolds throughout the city over a weekend in August – culminating with a spectacular firework display. There will plenty to amuse people of all tastes and ages at this event, so be sure to ingratiate yourself into Frankfurt life by checking it out. Once you have located the Old Opera House, you will be delighted to learn about the annual Opera Square Festival; each and every summer, the areas surrounding this grand old building is filled with worldwide cuisine and a number of different performances within the Opera House. Aficionados of the grape will also delight in the Rheingau Wine Festival, which brings hundreds of winemakers from all over the world to the same location to offer their wares every September. This is preceded by the Apple Wine Festival, celebrating Frankfurt’s most popular beverage, which combines market stalls of different apple wines with all kinds of stage entertainment in the city center. For more family-friendly shenanigans at the same time of year, however, be sure to check out the Autumn Dipperness at Ratsweg Fairground, which brings all the fun of the traveling fair to Frankfurt in September. The Frankfurt Motor Show – the largest such event in the world – also rolls into the city’s port every other year (those that conclude with an odd number). Frankfurt is actually one of the most US sports-friendly cities in Europe – the city boasts the Löwen Frankfurt ice hockey team, Frankfurt Universe football team, and the Skyliners basketball team. The two former teams are struggling a little, but if hoops are your passion then you’ll find plenty to enjoy at the Fraport Arena where the Skyliners ply their trade. Overall, though, soccer is the biggest passion in the city. Eintracht Frankfurt e.V. play their home games at the Commerzbank Arena. Although the team have not enjoyed much success in recent years, but they still enjoy a hugely enthusiastic fan base, with the stadium usually selling out on matchdays. Unfortunately Frankfurt endures a reputation as the most dangerous and volatile city in Germany. The positive spin on this, however, is that these crimes are not motivated by race hate or ethnic disputes, and even robberies and car thefts are comparatively low-key (though vehicular vandalism is something to keep an eye out for). The majority of crime in Frankfurt revolves around the drug trade, so if you steer clear of the city’s Red Light District you will largely be able to avoid any kind of trouble. This will also minimize your risk of becoming a victim of pickpocketing, which is also prevalent throughout the city, but be very vigilant when travelling the subway. The stats are also slightly skewed by the sheer amount of visitors to the city through the busy airport. Try not to let this news deter you from your move to Frankfurt, as the city also enjoys a substantial police presence – any ill behavior is quickly responded to by dialing 110 from any telephone. Debauchery isn’t necessarily high on the list of priorities for Frankfurt natives, with high art and culture generally considered preferable, but that isn’t to say that you won’t find plenty of ways to pass an evening outside of the theater or opera house. First thing’s first – if you are looking to save a few euros, avoid the city center once you have settled in sufficiently. Whilst the center of Frankfurt is quite costly for a night on the town, you’ll find plenty of other destinations that will provide more for your money if you drift toward the outskirts – including worldwide restaurants. This could become increasingly important to you if you fail to fully adapt to the tastes of the local produce. Chief among this is applewine (ebbelwoi in the native language), sold by the pitcher in all destinations in the city all year round and believed to be loaded with health benefits. It’s a pretty sharp sensation and may be an acquired taste, so if fermented apples do not appeal to your palate you could also try some of the local pilsners – Henninger and Binding are both brewed in Frankfurt. Head north to Rathenauplatze and Opernplatz for some inexpensive dining options, and Bornheim for open-air pubs, or Sachsenhausen, Bruckenstrasse and Dreieichstrasse to the south of the city will also offer different trendy experiences. Avoid the west unless you enjoy rubbing shoulders with the student population, and tread carefully if you decide to venture into Kaiserstrasse, around the area of the city’s train station – this is the Red Light District of Frankfurt. If your budget allows, Zeil and Bleichstrasse in the city center can provide extremely exclusive cocktails and clubs. Frankfurt has contributed plenty to world history, particularly through the Frankfurt School and the city’s impact on WW2. These books will give you a little flavor on what you may expect from the city you’re planning on calling home. Jezebel’s Daughter, by Wilkie Collins – a 19th Century high society drama from the celebrated English playwright and novelist, unfolding across the business centers of London and Frankfurt. Passenger to Frankfurt, by Agatha Christie– the 80th book written by the queen of mystery fiction. Spring Torrents, by Ivan Turgenev – a 19th Century tale of love and obsession, surrounding a wealthy Russian man discovering the love of his life in Frankfurt. The Diary of Anne Frank – the writer of the most famous – and gut wrenching –memoir of them all was born in Frankfurt before she moved to Amsterdam. Grand Hotel Abyss: The Lives at the Frankfurt School, by Stuart Jeffries – a look at the many bright young minds that studied at the Frankfurt school in the 1920s, and what became of these philosophical thinkers. The Frankfurt Auschwitz Trial, 1963-1965: Genocide, History, and the Limits of the Law, by Devin O. Pendas – it’s impossible to ignore the impact of WW2 on Germany, and the Frankfurt Auschwitz trial was the biggest of it’s type for holocaust perpetrators.